"A Little Less Than A God"
During one of the recent conclaves, I think it was the last, as the white smoke was rising in plumes from the Sistine Chapel chimney, a journalist was mingling through the gathering crowd seeking opinions on who might be the next Pope. One lady answered him, "I don't know who has been elected, but I know I love him". To love the Pope is part of our spiritual genetics as Catholics, we hold him who occupies the Office of Peter in deep veneration and give added weight to what he says because he is the Successor and Vicar of Peter and the Vicar of Christ, God's representative on earth, the head of the Church on earth. Interestingly, when Catholics lapse or turn to hate the Church, they often reserve a special contempt for the Pope; that's consistent. However, as we hold the Pope in particular veneration, we must be careful not to make an idol of him. The Pope is a servant of the Church, the servant of the servants of God, and so he too is subject to the doctrine, teachings and traditions of the Church. As Pope Benedict once said in response to a call for him to change certain doctrines: "But I am only the Pope, I can't change them". That was not a expression of humility on Benedict's part, nor an excuse to preserve the status quo, it was a statement of fact. The office of the Papacy is to preserve and protect what Christ has revealed as an act of service not only to God and to the truth, but also to the Faithful. The Pope is the symbol of unity in the Church, hence we speak of being in communion with the Pope, in communion with Peter, and so in communion with Christ who gave the keys to Peter to govern and to strengthen the faith of his brethren. Sadly, in the history of the Church there have been movements to extend the Pope's office beyond that which is permitted by revelation and tradition, movements to make the Pope, in a sense, an oracle in the Church. These movements are called ultramontane, a term from the Middle Ages it means "beyond the mountain" referring originally to a non-Italian who had been elected Pope and who came to Rome from beyond the mountains, the alps. It has since come to refer to a belief in the Pope's utter supremacy and infallibility in matters not only ecclesiastic and spiritual but even political. One of the most fervent periods of ultramontanism occurred in the 19th century as the dogma of the infallibility of the Pope was being debated. There were some who sought an all-encompassing definition, but there were others, Blessed John Henry Newman among them, who shied away from this, they understood the proper role of the Pope and feared the development of an attitude that raised the Pope to the level of a god, an oracle. When Blessed Pius IX defined the dogma it was within the parameters of the tradition, but there are still some who misinterpret it in high papalist fashion. Why all this? Well yesterday I read a piece on the issues being discussed in the Synod and it seemed to be the perfect example of ultramontanism. For charity's sake I will not say who the writer is, but the person was arguing for a change in the law regarding Communion for the divorced and remarried. This writer drew on Pope Francis's remarks that the Eucharist is not a prize for the strong but a medicine for the weak. Responding to a critique of this remark that the weak did not mean the unrepentant in mortal sin, this writer came to the conclusion that the unrepentant are the weak and they need the Eucharist to make them strong to repent. The writer is wrong: arguing that in the name of mercy, those who persist in mortal sin can have access to the Eucharist because they are in a persistent state of mortal sin. Not only does this undermine the teaching of the Church and the teaching of Christ himself, it does not make sense. There are plenty of arguments out there to answer the position this writer has taken, but the person proposing this has been for many years an orthodox Catholic, a great defender of Pope Benedict XVI during his papacy when many were attacking him, a defender of that Pope's teaching on this issue as laid out quite clearly in Sacramentum Caritatis (Cf. section 29). But why the sea-change so suddenly? The answer, it seems to me concerns devotion to the Pope. This person is a great defender of Pope Francis just as much as Pope Benedict and, rightly, has defended Francis in face of unjust attacks on him. There are those in the Church who do not like him, for various reasons, and so he can do no right. That attitude to the Pope is wrong and unjust. As Pope, the legitimate Pope, Francis deserves our loyalty, our love and our prayers. That said it does not mean we become ultramontanist and believe that everything a Pope says and does is right and must be adhered to. Every Pope makes mistakes and there are times when, as loyal children of the Pope, we must correct him. Scripture offers us an example of this in St Paul's challenging St Peter (Galatians 2:11-14). This challenge, however, must be subject to charity and that respect due to the office. If a Pope is wrong, it is not disloyalty to question him or even at times to oppose him. If a Pope proposes a change in teaching or practice which undermines orthodox teaching it is not disloyalty to challenge or oppose him. At times Popes have been wrong in terms of decisions, judgements, personal beliefs, there have even been situations where Popes veered very close to heresy, and it would be wrong prudentially to slavishly follow them at such times. The fact that Popes can be wrong does not undermine that special charism which is given to the Pope to preserve the doctrinal integrity of the Faith. Papal infallibility falls within very narrow parameters that are defined, they do not include off cuff remarks nor casual teachings. The charism does not prevent a Pope going off in the wrong direction and preparing teaching that is erroneous, it merely prevents him promulgating it in a formal magisterial document. For a good illustration of this see the example of Pope Sixtus V (which is very sobering). In recent times we have heard defenders of Pope Francis brand as disloyal and unCatholic those who are troubled with some things he says. Even figures within the Vatican are targeting orthodox Catholics, great defenders of the faith known for their good lives and expertise, who are defending Church law in the face of attempts by some to change it. Ironically many of those who are responsible for these accusations were not known for their loyalty to previous Popes. But there are those who were firm defenders of Francis successors, one indeed, a senior Church figure, who told the Pope recently that the Holy Spirit speaks through him and so we must assent and follow everything he says. The Holy Spirit does try to guide the Pope in a special way, but that does not mean every word uttered by a Pope comes from the Spirit. Such panegyrics are expressions of thoughtless ultramontanism, expressions that would make Blessed Pius IX blush, and, I hope, make Pope Francis extremely uncomfortable. But, sadly, at the beginning of the 21st Century, this is where we are again. Pope Francis once said, "I am a faithful son of the Church" and that is what he aims to be and should aim to be, as we all should be. He has no power to change Church teaching, and even if in a fit of madness or abandon he tried to turn Church teaching on its head and demand our adherence, the loyal expression of our love to the Office of Peter would be to resist it - for our sakes, for the sake of the Church and for the sake of the Vicar of Christ. 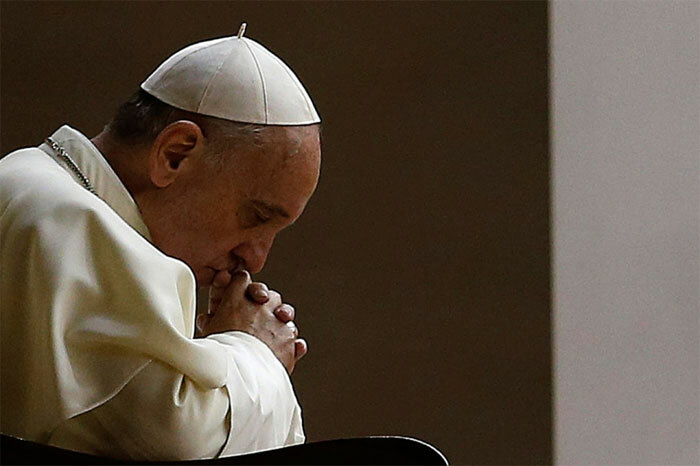 Every Pope is a weak man called to the highest office on earth, a most lonely and fearful position, and called to be the symbol of unity of the Church and the defender of the Faith. It is an office that will one day cost him his life, and he is asked to lay that life down in imitation of Christ and in imitation of the one he succeeds - Peter crucified on the very hill on which the Pope now lives. He needs the prayer and support of the faithful, not their presumption that he is an oracle, a superhuman entity infused with divine wisdom. He is a man called to be the Holy Father, the Universal Pastor, not God.